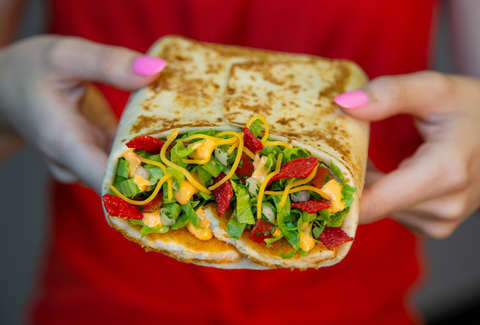 While Taco Bell has long relied on insane menu creations like the Quesalupa and Triple Double Crunchwrap to keep things interesting, the chain has also followed a strategy that generally consists of introducing new foods everyone loves, discontinuing them for a number of months, then reintroducing them to much fanfare. Think the Beefy Crunch Burrito, Naked Chicken Chalupa, and recently, Nacho Fries. But for its latest menu throwback, the Doritos Locos purveyor had to reach waaaaay back -- to nearly a decade ago. The edible time capsule of sorts is called the Tortada, and as longtime T-Bell fans will remember, it's a big, square-shaped cross between a torta (sandwich) and a tostada that's stuffed with meat, cheese, lettuce, tomatoes, and sauce. The last time they were on Taco Bell's national menu was April 2010. Now, it looks like the chain is bringing them back with a new twist, though not for a nationwide release. At least, not yet. Taco Bell locations in Kansas City, Missouri are currently testing two new versions of the Tortada: a Chicken Tortada with Avocado Ranch and a Chicken Tortada with Mango Habanero sauce. Both are made by packing four chicken nugget-like Crispy Chicken Chips, red tortilla strips, lettuce, cheddar cheese, pico de gallo, and their respective sauces into a soft tortilla, then folding it and grilling the outside sort of like a panini. Both are available at the Kansas City locations through mid-October, according to a Taco Bell spokesperson. So far, there's no word on when Tortadas will land at your local T-Bell, but if the chain's past releases are any indication, it probably won't be long.